Kids In Motion offers free workshop for parents, professionals, physicians, caregivers, daycare workers or anyone interested in learning. Typically they are held during the week, during the school year at one of our clinics or area schools and libraries. We are willing to take our workshops into the community, even for staff training’s at area preschools. If your school, church, organization needs a speaker please call 248-707-3100 to schedule. Workshops are free to the community or there is a small charge for professionals or staff training. 2019 Upcoming Workshops: * Autism, Motivation & Overcoming Life’s Stress by Ron Sandison * Common Childhood Feet Conditions * Overuse Syndrome, Anxiety, ADHD-the Perfect Storm and much more. 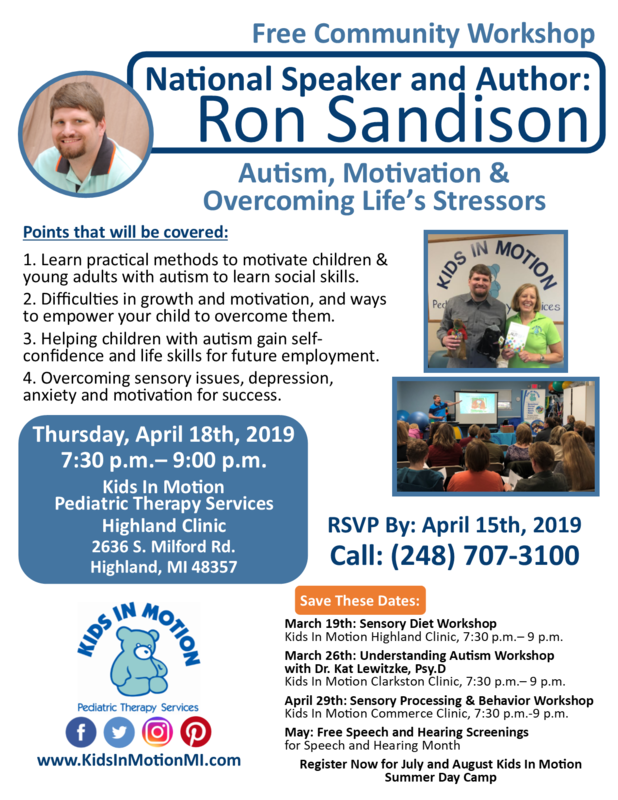 Autism, Motivation & Overcoming Life’s Stress by National speaker/author: Ron Sandison – April 18th 7:30 – 9:00 p.m.
Sensory Systems & Processing Basics – February 26, 2019 Kids In Motion Brighton: 7:30 – 9:00 p.m. Speech and Language Development – November 13, 2018 Kids In Motion Highland: 7:30-9:00 p.m.
Special Needs Sensitivity Training – November 8th 2018 – Kids In Motion Commerce: 7 p.m.- 8:30 p.m.
Handwriting Without Tears – October 24th 2018 – Kids In Motion Commerce: 7:30 – 9:00 p.m.
School-based Therapy and Clinic-based Therapy: What’s The Difference? 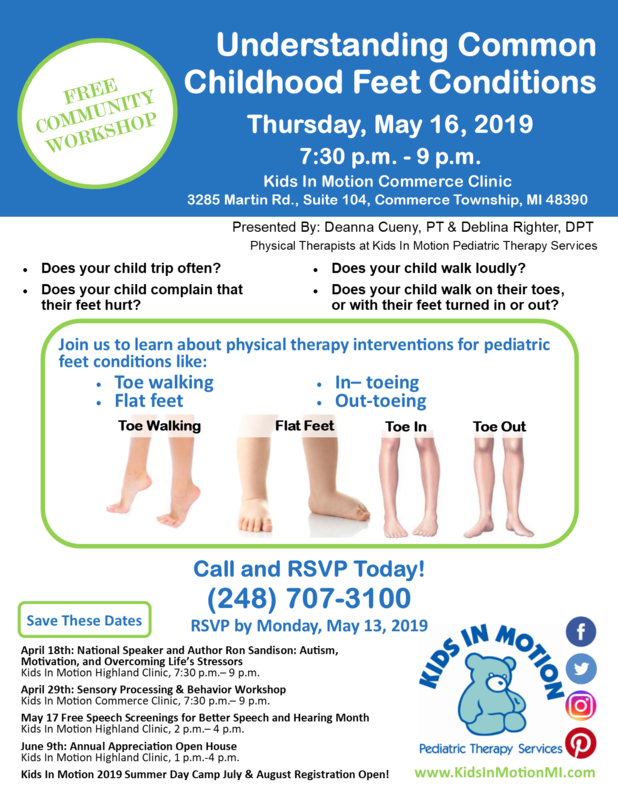 – September 26th, 2018 Kids In Motion Commerce Clinic 7:30 p.m. – 9 p.m.
Developmental Delay Workshop- September 20th, 2018 Kids In Motion Clarkston Clinic 7:30 p.m.- 9 p.m.
** Paid Workshop. Occasionally we find a GREAT resource for specific challenges that our team feels is important to introduce to our kids. Please call if there are any other topics you would like to hear us speak on. We are also available to present an informative workshop at your school, library or workplace. Do you need a certificate for hours of training?